You wake up to a blue bird day, with 2 feet of fresh powder laying still on the mountains above Lake Tahoe. Your new back-country ski gear sits next to the front door and you can’t wait to enjoy your first day of skiing where the lifts don’t run. Stop. Have you taken a Level One Avalanche Course and understand the dangers of avalanches? Have you checked the day’s forecast and advisories with the Sierra Avalanche Center? 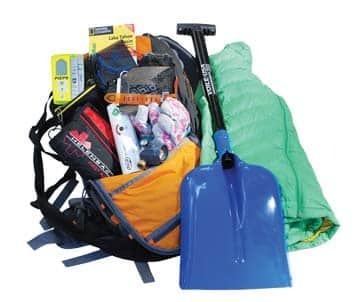 Do you have an avalanche beacon, shovel, probe and avalanche bag and understand how to use them? Are you going with at least one other person is her or she they also avalanche trained so you can rescue each other in the event of a slide? Have you told someone where you are going and when you expect to be back? If you cannot answer yes to all these questions, you are not ready to ski in avalanche-prone terrain. Instead, it’s time to go to school. While getting an avalanche advisory every morning before going is key, skiers and snowboarders also need to understand what the forecast means and how to apply it. The best place to get that knowledge is through an American Institute for Avalanche Research and Education (AIARE) Level One course. 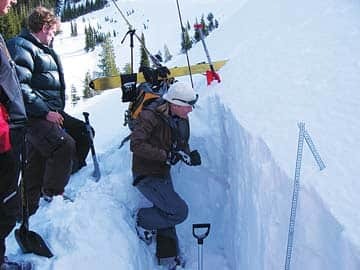 These three-day courses teach the dynamics of snow and what causes avalanches, but equally importantly, they focus on know how to make good decisions. “It teaches you tools and checklists to help you avoid making critical mistakes out there that could end your life,” said Tone. Avalanches are caused by a combination of the current condition of the snowpack, wind speed, steepness of the terrain, altitude and the compass orientation of the slope. One danger for skiers is that the 35- to 40-degree slope that usually triggers avalanches is also a preferred steepness for skiing. Avalanches can be triggered by wind, a skier, a snowmobile or when the snowpack reaches its breaking point. 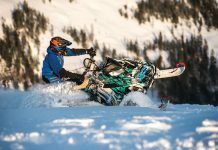 Avalanche classes teach back-country enthusiasts how to be prepared to help fellow adventurers should an avalanche occur. This means learning how to use beacons, probes, shovels and airbags. 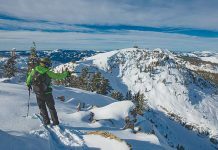 About one-third of an avi class is indoors, with two-thirds of the time spent outdoors learning about snowpack, how to use rescue tools and how to determine a slope’s avalanche danger. “Snow can have dozens of individual layers. They change through time and that will make the snow stronger or weaker,” says Randall Osterhuber, who has been teaching avalanche courses through Donner Summit Avalanche Seminars for the past 15 years. 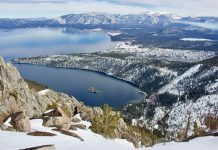 He says that every winter develops a unique snowpack, so it is critical to know how to interpret the changing conditions. The key is that every person in a party must feel comfortable making a decision to change the route or cancel the day. 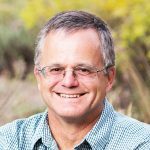 Having good information and being skilled at understanding the terrain and the snow conditions is key, but even the most skilled avalanche forecasters sometimes get caught in avalanches. “A few years ago. I had to deploy my airbag and tomahawked for 500 to 600 feet. If you play in the medium enough, it can happen,” said Tone. The goal of avalanche training is to have the knowledge to reduce the odds of avoiding an avalanche in the first place, and to be prepared to rescue your friends if it does. 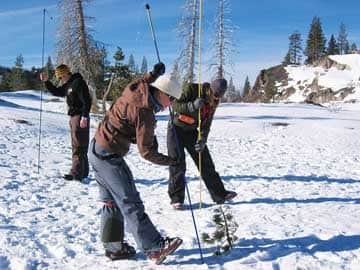 For more information on avalanche safety, Tahoe area advisories and conditions, and for resources on local education classes, visit sierraavalanchecenter.org. Practice with the gear regularly. Is anyone outside his or her comfort zone? Is the group discussing options & concerns?